Recently the lovely Terri aka Theresa Pesce Happe of the Cake Decorating Corner interviewed me for her website. 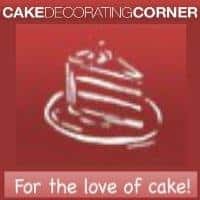 You can visit her website The Cake Decorating Corner for a lot of wonderful cake related stuff. Cake contest, tutorials as well as up and trendy happenings in the cake world and of course interviews with some of the most elite cake artist in the cake industry. I do hope you like the interview. Thank you so much Terri for taking the time from your busy schedule to write such kind words about me. Here is what she says of the humble me. A talented cake artist living in Israel and owner of Veena’s Art of Cake, Veena was born in Bombay, India, and began her career working as a flight attendant for Singapore Airlines. Following graduation from college where she majored in English literature, she wanted to see the world and spent the following ten years doing just that with the airline. “I loved traveling and those were definitely the best years of my life,” Veena says. She attained her second degree in marketing through the University of Ireland while living in Singapore. Later, Veena pursued her MBA in a similar fashion from the University of Chicago. While traveling as a flight attendant, Veena met her husband Ziv, an American Israeli living in San Francisco. Together, they moved to Israel to be closer to his family where they have resided for the last decade. Initially, Azmanov pursued a degree in English literature out of a love for teaching and mentoring. Upon traveling to Singapore, she adopted a fondness for marketing. Given that her original intention was to work as a flight attendant for just a few years, she pursued a degree marketing which eventually led to her attaining a MBA. Upon her arrival in Israel, Veena sought a job in marketing, but she and her husband ultimately decided that having a full-time parent at home for the first five years was the best plan for raising their children. By the time her daughter Rhea reached two years of age, Veena had already fallen in love with decorating cakes. Veena has been decorating cakes since 2009, when she made her very first cake for her daughter. She instantly fell in love with fondant. “Before that I baked lots of cakes and desserts, but never really decorated with fondant. It took me almost two years to finally realize that I would love to do this for a living and, in July 2011, I decided to do this professionally,” she said. Because Veena has lived and worked in such diverse cultural environments, one of the things I was curious about was how she handled servicing a community where a large population would require specific ingredients and kitchen conditions. “There are many who eat only kosher cakes here. Most ingredients found in the local super markets are of course Kosher. For those who need Parve, meaning dairy-free, I am able to accommodate them but not those customers who require food coming out of a Kosher Kitchen. My home kitchen is not Kosher Certified and I personally am not Jewish and do not follow any Shabbat regulation. It does effect business to some extent but, in general, I do attract a lot of customers that are liberal and do not have any such restriction,” Veena said. “I must say the most difficult challenge has been creating a need for cake where I am. Three years ago, most wedding, birthdays and celebrations had no cakes. It’s not a part of the culture to have a wedding cake and because the cost of living is high, it’s easily scrapped from the budget. But times are changing and people are becoming more and more aware of cakes. Brides want it, kids want it and parents are also excited to have something special for their kids,” she explains. “When I came to Israel, things were different. I found it very difficult to live and be here. I personally could not blend in. I tried to learn the language but, honestly, it was too difficult for me. The culture was different, too. So, yes, I had to make many adjustments but, on the whole, I think I did well. I try my best to blend in when possible,” she adds. Veena’s specialty is wedding cakes but she still does enjoy creating the random novelty or sculpted cake when she has the opportunity. Regardless of shyness, Veena maintains a large social presence thanks to her popular blog and video tutorials. Veena’s short term goals include refining her skills in order to take pride in every cake she makes. Ultimately, she hopes to set an example that others in her profession will want to follow. “I hope that someday I will be as good as the people that I truly admire and aspire to be,” she says. Veena’s greatest artistic influences have been Ron Ben Israel and Mercedes Strachwsky. “I have been admiring Ron’s work even before I started cake decorating and every time I feel down on my work, I go admire his cakes which somehow gives me the drive to go back and do better. Mercedes Strachwsky gave me the confidence to take up cake decorating as a profession despite no formal cake decorating background or knowledge. She actually started self-taught and won the Oklahoma Grand National Cake Competition in 2009. I figured if working hard and passion could get me to even 1/10 the skill she possesses, it would be worth trying. She has truly inspired me,” she shared. Veena’s work has indeed gained worldwide recognition and has led to her being asked to participate in many collaborative projects. The love of cake decorating has become an international passion emanating from all corners of the planet. Veena’s cake artistry and worldwide following are an exceptional example of the influence and encouragement in others experienced by sharing our own designs and tips. If you’d like to see more of Veena’s work, visit her website Veena’s Art of Cake (link is external).